To Cite: Mohsenabadi H, Shabani M J , Zanjani Z. Factor Structure and Reliability of the Mindfulness Attention Awareness Scale for Adolescents and the Relationship Between Mindfulness and Anxiety in Adolescents, Iran J Psychiatry Behav Sci. 2019 ; 13(1):e64097. doi: 10.5812/ijpbs.64097. Background: In recent years, application and practice of mindfulness-based interventions to reduce adolescent psychological problems are increasing. Therefore, it is necessary to design and study tools that measure mindfulness and its effects. Objectives: One of the available tools to measure mindfulness in adolescents is the mindfulness attention awareness scale for adolescents (MAAS-A). The current study aimed at examining the factor structure and reliability of a Persian version of this scale and investigating the relationship between mindfulness and anxiety. Methods: The current descriptive, cross sectional and psychometric study was conducted on 354 students from Kashan city, Iran, selected via the cluster sampling method in 2017. The exploratory factor analysis (EFA) by the principle component analysis method, the confirmatory factor analysis (CFA), and the relationship between mindfulness and anxiety were conducted to examine the validity of the MAAS-A. To calculate the reliability of the MAAS-A, Cronbach’s alpha and test-retest reliability (four-week interval) were employed. The statistical analysis was performed with SPSS version 19.0 and AMOS-22. Results: The results of the EFA suggested two factors for this scale labeled as “acting with attention and awareness” and “attention to the present moment”. The CFA confirmed the two-factor model of the 14-item scale (the root mean square error of approximation (RMSEA) 90% confidence interval (CI) = 0.001 - 0.06). The reliability of this scale was good (α = 0.81, retest reliability = 0.86) and the correlation between mindfulness and anxiety was negative and significant (r = -0.43, P < 0.01). Also, this relationship was significant in females (r = -0.44, P < 0.01) and males (r = -0.46, P < 0.01). Conclusions: According to the results of the current study, the MAAS-A was a reliable and valuable scale to measure the mindfulness of adolescents. The results of correlation between mindfulness and anxiety meant that by increasing mindfulness, the anxiety reduced in adolescents. In recent decade, the concept of mindfulness received the attention of many researchers and the mindfulness-based interventions increased (1, 2). Mindfulness as a method to pay attention, originated from eastern Meditation practices (3), and is described as complete attention to the present experiences (4). Two components are emphasized in defining mindfulness: self-regulation of attention and nurturing a non-judgmental orientation based on acceptance (5). Through mindfulness-based techniques, one becomes mindful towards daily activities. The individual becomes aware of the automatic function of the mind and it’s ruminating over the past and the possible future. Through this insight, the person gains control over thoughts, feelings, and sensations, and becomes free from automatically focusing on the past and future (6). Studies showed a negative correlation between mindfulness and psychological disorders such as depression, anxiety, and drug abuse (7, 8). Also, effectiveness of mindfulness training on these disorders in adults was reported (9, 10). However, the education of mindfulness for children and adolescents is growing rapidly, but studies on its effectiveness are still in the early stages (11, 12). A few preliminary studies show the effectiveness of mindfulness-based treatments in children with anxiety (13, 14), conduct disorder and aggressive behaviors (15), depression, and stress (16). As mindfulness-based interventions in adolescents are increasing, there is a need for tools to measure mindfulness skills in this population (17). Various tools are designed to measure mindfulness, some widely in use are: the Freiburg mindfulness inventory (FMI) (18), the mindfulness attention awareness scale (MAAS) (19), the Kentucky inventory of mindfulness skills (KIMS) (20), the Toronto mindfulness scale (TMS) (21), the cognitive and affective mindfulness scale-revised (CAMS-R) (22), and the five facet mindfulness questionnaire (FFMQ) (17). However, there are only two tools available to measure mindfulness in children and adolescents, which are the MAAS-A (23), and child and adolescent mindfulness measure (CAMM) (24). The MAAS-A developed by Brown et al. (23), is based on its adult version (MASS). Brown et al. (23), reported one factor for it by EFA. The results of studies conducted by its authors showed a good reliability and validity for this tool (23). The psychometric proportion of this scale is reported in various countries. For example, the study of the MASS-A Dutch version confirmed the one-factor structure of this scale, and reported a high internal consistency. The MAAS-A also showed a positive correlation with happiness and negative correlation with stress (25). Another study in Spain also confirmed one-factor model of the MAAS-A in teenagers of 14 - 18 years. The study reported the negative correlations between MASS-A with depression, anti-social behaviors, and aggression (26). According to the current study review, there is no tool to measure mindfulness in children and adolescents in Iran. Therefore, the current study aimed at investigating the factor structure and reliability of the Persian version of the MAAS-A, and examining the relationship between mindfulness and anxiety in adolescents. Due to the importance of mindfulness, the current study aimed at examining the factor structure and reliability of a Persian version of MAAS-A, and investigating the relationship between mindfulness and anxiety in adolescents. The current cross sectional and psychometric study was conducted on 12 - 18-year-old school students of Kashan city, Iran, in the school year 2016 - 2017. According to Polit and Beck (27), to perform the EFA, for each item in scale, 5 - 10 samples are required; and for the CFA, Myers et al. (28), suggested that a sample size of 200 individuals is adequate. Therefore, given the number of MASS-A items (14 items) and by calculating probability drop, the sample size was considered 160 subjects to study EFA and 210 individuals for CFA that were selected by multi-stage cluster sampling across 12 schools (six females’ schools, six males’ schools). In the end, 354 individuals (154 for EFA and 200 for CFA) fully responded to all the scales (mean age ± standard deviation (SD) = 15.27 ± 1.36). Permission from the scale author was secured via email; next, the scale was translated into Persian by two individuals, separately, fluent in both Persian and English, then the translated copies were presented to a group of clinical psychologists familiar with the acceptance and commitment-based treatment (ACT), and their comments were considered. The translated versions, along with a copy of the original version were given to two translators familiar with English and psychology, not present in previous stages. They were asked to evaluate the equivalence of the translated and original version. Then, 10 adolescents were asked to complete the questionnaire and their opinions about the readability, clarity, and comprehensibility of the items were examined. They did not report a problem with clarity of items. Afterwards, the back-translation of the Persian version into English was performed by two individuals expert in English and psychology that had not seen the original version. Then, this copy was compared with the original version, and it was evaluated in terms of inconsistencies. In the next step, the psychometric properties of the scale were studied. For this purpose, 370 individuals were selected from Kashan students via cluster sampling. Furthermore, 45 respondents were tested again after four weeks. The construct validity of the scale was studied via the EFA and CFA. The test-retest method, as well as the internal consistency (IC) was used to determine the reliability of this scale. To examine the relationship between mindfulness and anxiety, participants completed the revised children’s manifest anxiety scale (RCMAS). The research process and objectives of the study were explained to the enrolled students and their parents and written informed consent, considering the ethical issues, was obtained from them. Then, the study subjects responded to the scales. Also, the current study protocol was approved by the Ethics Committee of Kashan University of Medical Sciences (grant number: IR.KAUMS.REC.1396.27). This 14-item scale was developed by Brown et al. (23), based on its adult version designed by Brown and Ryan (19). The scoring is based on a six-point Likert scale (from 1 = almost always to 6 = almost never). A higher score in this scale indicates a higher degree of mindfulness. The result of Cronbach’s alpha (0.82 - 0.84) and the retest reliability (r = 0.79, P < 0.001) were acceptable in two groups of adolescents (23). They reported the correlation between the negative affect (the positive and negative affect schedule (PANAS) (r = -0.41, P < 0.001) and MAAS-A (23). This scale was psychometrically confirmed in Spain and the Netherlands. This 37-item scale is developed by Reynolds and Richmond (29) to evaluate various signs of anxiety. The children are asked to answer each item with yes/no, and each item is scored either “zero” or “one”. The items were designed for children aged 8 and higher. A retest reliability of r = 0.77 (P < 0.01) was reported for this scale (30). The convergent validity of MASS-R with RCMAS (r = 0.85, P < 0.001), and the state-trait anxiety inventory for children were reported good (STAIC) (31). Taghavi and Alishahi (32) examined the validity and reliability of the Persian version of this scale. They reported its test-retest reliability with an interval of three to four weeks (r = 0.67, P < 0.001). They showed that RCMAS could distinguish the children and adolescents with anxiety from the normal ones (P < 0.001). Data normality was examined by the Shapiro-Wilk test. EFA was conducted using the Kaiser-Meyer-Olkin (KMO) index and the Bartlett test, principal components analysis, and the varimax rotation. Fit indexes used to examine the model were relative χ2 (χ2/df), goodness-of-fit index statistic (GFI), the adjusted goodness-of-fit statistic (AGFI), the Tucker-Lewis index (TLI), the comparative fit index (CFI), and the root mean square error of approximation (RMSEA).To calculate the reliability of the MAAS-A, Cronbach’s alpha and test-retest reliability (four-week interval) were used. The results were analyzed with SPSS version 19.0 and AMOS-22 software. The participants consisted of 187 males (52.8%) and 167 females (47.2%), in the age range of 12 - 18 years, with 15.27 ± 1.36 years as the mean ± SD of age. Of the 354 participants, 107 individuals were in the age range of 12 - 15 and 247 in the range of 15 - 18 years. The mean age was 59.43 ± 10.30 years for the MAAS-A and 10.69 ± 5.77 years for the RCMAS. The two subsamples were not significantly different in terms of age (t = 0.26, P = 0.79), gender (χ2 = 126, P = 0.72), MAAS-A total (t = 1.13, P = 0.25), and anxiety (t = 0.50, P = 0.61). To study the construct validity, the EFA was applied using principal component analysis. According to this analysis, the KMO coefficient value was 0.73, and the Bartlett χ2 was 468.80 (P < 0.001). It was suggested that the sample and selected variables were adequate for the factor analysis. The EFA showed two factors for this scale (Table 1). The current study results showed that items 2, 4, 5, 6, 7, 8, 10, 13, and 14 could be loaded on the first factor (eigenvalue = 3.15). Items 1, 3, 9, 11, and 12 were placed on the second factor (eigenvalue = 2.38). Based on the content of the items and the definition of mindfulness concept in the third wave theories, it can be said that the first factor measures the “acting with attention and mindfulness” and the second factor measures the “attention to the present-moment”. The results of the EFA were different from those of the Brown et al. 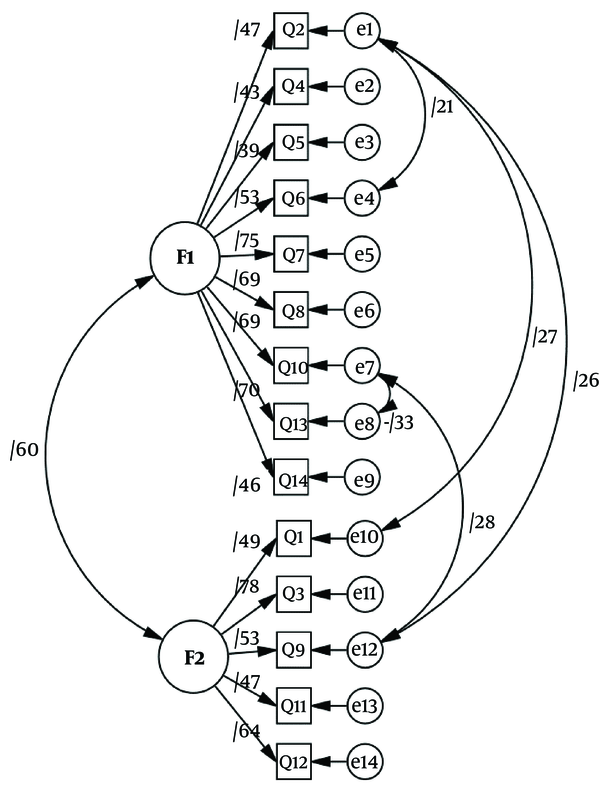 ; therefore, the one-factor structure was changed to a two-factor structure. The CFA was employed to ensure the accuracy of this structure (Table 2). It is suggested that the χ2/DF < 5 reveals an acceptable fit of the model and < 2 indicates a good fit of the model (33). Also, GFI, AGFI, TLI, and CFI ≥ 0.90 and the RMSEA ≤ 0.05 show a good fit of the model (34). Based on the abovementioned issues, and according to Table 2, it can be concluded that the two-factor model had a desirable fit (Figure 1). Cronbach’s alpha for the total score, factor 1, and factor 2 was 0.81, 0.78, and 0.70, respectively. This finding indicated the good internal consistency of this scale. The test-retest reliability (four-week interval) total, factor 1, and factor 2 was 0.86, 0.75, and 0.74, respectively; and all were significant at P < 0.01. The current study results indicated that the MAAS-A total and the RCMAS total were significantly related (r = -0.43). The correlations between the MASS-A subscales and that of the RCMAS total were -0.30 (subscale 1), -0.40 (subscale 2), and all were significant (P < 0.01). This meant the divergent validity of MASS-A. Table 3 shows the correlations between the factors of the RCMAS and MAAS-A disaggregated by gender. Given the rising interest in a tool to measure mindfulness in adolescents, the current study aimed at evaluating the psychometric properties and cross-cultural perspectives of a Persian version of the MAAS-A in Iranian adolescents. The factor structure, internal consistency, and test-retest reliability of this scale were studied. The results of the EFA revealed two factors called “acting with attention and awareness” and “attention to the present moment”. Further, the CFA showed that the two-factor model of this scale had a desirable fit. In total, the two factors accounted for 39.59% of the total variance, which was higher than the 32.52% of the results for the original version by Brown et al. (23), and the 33.59% obtained by the Spanish version (25). Consequently, it is better to use the two-factor model. Regarding the reliability of this scale, the results showed an acceptable internal consistency of the scale total (α = 0.81), which is similar to the original version (α = 0.82). Another aim was to examine the relationship between mindfulness and anxiety. It was observed that the total score and its subscales were negatively correlated with RCMAS, suggesting that more mindful people experience less anxiety. Many studies show a negative relationship between the mindfulness and neuroticism in various samples (17, 19). In a study, negative correlation between the four scales of anxiety and mindfulness was found (19). Moreover, in another study, a negative correlation between MAAS and anxiety arousal was acquired (35). Since defective attention is the main sign of anxiety, strategies such as mindfulness can be effective in improving the attention of the students and alleviating anxiety (14). Furthermore, given the effectiveness of mindfulness-based interventions on anxiety (36) and according to the present result, it can be said the mindfulness-based interventions can be used for the treatment of anxiety in adolescents. The limitations of the present study were: (1) Use of a non-clinical sample similar to the study by Brown on its original version (23), and (2) use of the limited adequate questionnaires to assess the convergent validity of the scale because of a few valid questionnaires in the adolescent population in Iran. Therefore, it is recommended to assess the validity and reliability of this scale in further studies in clinical adolescent samples, and also to take advantage of more questionnaires. Despite these limitations, it can be said that the MAAS-A has acceptable psychometric properties in the Iranian population, and is confident to measure mindfulness. This scale can also be used to evaluate the effectiveness of the mindfulness-based interventions in adolescents. The authors wish to thank all the school administrations and participants for their participation in the study. Authors' Contribution: Hamid Mohsenabadi designed the study, collected the data, and drafted the manuscript. Mahammad Javad Shabani participated in designing the study, analyzing the data, and writing the manuscript. Zahra Zanjani designed the study, reevaluated the data and revised the manuscript. All the authors read and approved the final manuscript. Declaration of Interest: Authors declared no conflict of interest. Ethical Considerations: All procedures performed in the study on human participants were in accordance with the ethical standards of the Institutional and/or National Research Committee, and the 1964 Declaration of Helsinki and its later amendments, or comparable ethical standards. Funding/Support: The research was financially supported by Research Deputy of Kashan University of Medical Sciences, Kashan, Iran. 1. Kabat-Zinn J, Hanh TN. Full catastrophe living: using the wisdom of your body and mind to face stress, pain, and illness. Random House Publishing Group; 2009. 2. Williams JMG, Teasdale JD, Segal ZV. The mindful way through depression: freeing yourself from chronic unhappiness. Guilford Publications; 2007. 3. Baer RA. Mindfulness training as a clinical intervention: A conceptual and empirical review. Clin Psychol: Sci Pract. 2006;10(2):125-43. doi: 10.1093/clipsy.bpg015. 4. Kabat-Zinn J. Mindfulness-based interventions in context: Past, present, and future. Clin Psychol: Sci Pract. 2006;10(2):144-56. doi: 10.1093/clipsy.bpg016. 5. Malinowski P. Neural mechanisms of attentional control in mindfulness meditation. Front Neurosci. 2013;7:8. doi: 10.3389/fnins.2013.00008. [PubMed: 23382709]. [PubMed Central: PMC3563089]. 6. Segal ZV, Williams M, Teasdale J, Kabat-Zinn J. Mindfulness-based cognitive therapy for depression, second edition. Guilford Publications; 2012. 7. Black DS, Sussman S, Johnson CA, Milam J. Trait mindfulness helps shield decision-making from translating into health-risk behavior. J Adolesc Health. 2012;51(6):588-92. doi: 10.1016/j.jadohealth.2012.03.011. [PubMed: 23174469]. [PubMed Central: PMC3505281]. 8. Lawlor MS, Schonert-Reichl KA, Gadermann AM, Zumbo BD. A validation study of the mindful attention awareness scale adapted for children. Mindfulness. 2013;5(6):730-41. doi: 10.1007/s12671-013-0228-4. 9. Evans S, Ferrando S, Carr C, Haglin D. Mindfulness-based stress reduction (MBSR) and distress in a community-based sample. Clin Psychol Psychother. 2011;18(6):553-8. doi: 10.1002/cpp.727. [PubMed: 20878904]. 10. Shapiro SL, Oman D, Thoresen CE, Plante TG, Flinders T. Cultivating mindfulness: effects on well-being. J Clin Psychol. 2008;64(7):840-62. doi: 10.1002/jclp.20491. [PubMed: 18484600]. 11. Harnett PH, Dawe S. The contribution of mindfulness-based therapies for children and families and proposed conceptual integration. J Child Adolesc Ment Health. 2012;17(4):195-208. doi: 10.1111/j.1475-3588.2011.00643.x. 12. Greco LA, Hayes SC. Acceptance and mindfulness treatments for children & adolescents: a practitioner's guide. Context Press; 2008. 13. Semple RJ, Lee J, Rosa D, Miller LF. A randomized trial of mindfulness-based cognitive therapy for children: promoting mindful attention to enhance social-emotional resiliency in children. J Child Fam Stud. 2009;19(2):218-29. doi: 10.1007/s10826-009-9301-y. 14. Semple RJ, Reid EFG, Miller LF. Treating anxiety with mindfulness: an open trial of mindfulness training for anxious children. J Cogn Psychother. 2005;19(4):379-92. doi: 10.1891/jcop.2005.19.4.379. 15. Singh NN, Lancioni GE, Singh Joy SD, Winton ASW, Sabaawi M, Wahler RG, et al. Adolescents with conduct disorder can be mindful of their aggressive behavior. J Emot Behav Disord. 2016;15(1):56-63. doi: 10.1177/10634266070150010601. 16. Lau N, Hue M. Preliminary outcomes of a mindfulness-based programme for Hong Kong adolescents in schools: well-being, stress and depressive symptoms. Int J Child Spiritual. 2011;16(4):315-30. doi: 10.1080/1364436x.2011.639747. 17. Baer RA, Smith GT, Hopkins J, Krietemeyer J, Toney L. Using self-report assessment methods to explore facets of mindfulness. Assessment. 2006;13(1):27-45. doi: 10.1177/1073191105283504. [PubMed: 16443717]. 18. Buchheld N, Grossman P, Walach H. Measuring mindfulness in insight meditation (Vipassana) and meditationbased psychotherapy: The development of the freiburg mindfulness inventory (FMI). J Med Res. 2001. 19. Brown KW, Ryan RM. The benefits of being present: Mindfulness and its role in psychological well-being. J Pers Soc Psychol. 2003;84(4):822-48. doi: 10.1037/0022-3514.84.4.822. 20. Baer RA, Smith GT, Allen KB. Assessment of mindfulness by self-report: the Kentucky inventory of mindfulness skills. Assessment. 2004;11(3):191-206. doi: 10.1177/1073191104268029. [PubMed: 15358875]. 21. Lau MA, Bishop SR, Segal ZV, Buis T, Anderson ND, Carlson L, et al. The Toronto mindfulness scale: development and validation. J Clin Psychol. 2006;62(12):1445-67. doi: 10.1002/jclp.20326. [PubMed: 17019673]. 22. Feldman G, Hayes A, Kumar S, Greeson J, Laurenceau JP. Mindfulness and emotion regulation: the development and initial validation of the cognitive and affective mindfulness scale-revised (CAMS-R). J Psychopathol Behav Assess. 2006;29(3):177-90. doi: 10.1007/s10862-006-9035-8. 23. Brown KW, West AM, Loverich TM, Biegel GM. Assessing adolescent mindfulness: validation of an adapted mindful attention awareness scale in adolescent normative and psychiatric populations. Psychol Assess. 2011;23(4):1023-33. doi: 10.1037/a0021338. [PubMed: 21319908]. 24. Greco LA, Baer RA, Smith GT. Assessing mindfulness in children and adolescents: development and validation of the child and adolescent mindfulness measure (CAMM). Psychol Assess. 2011;23(3):606-14. doi: 10.1037/a0022819. [PubMed: 21480722]. 25. De Bruin EI, Zijlstra BJ, van de Weijer-Bergsma E, Bogels SM. The mindful attention awareness scale for adolescents (MAAS-A): Psychometric properties in a dutch sample. Mindfulness (N Y). 2011;2(3):201-11. doi: 10.1007/s12671-011-0061-6. [PubMed: 21909342]. [PubMed Central: PMC3146710]. 26. Cebolla A, Luciano JV, DeMarzo MP, Navarro-Gil M, Campayo JG. Psychometric properties of the Spanish version of the mindful attention awareness scale (MAAS) in patients with fibromyalgia. Health Qual Life Outcomes. 2013;11:6. doi: 10.1186/1477-7525-11-6. [PubMed: 23317306]. [PubMed Central: PMC3554469]. 27. Polit DF, Beck CT. Nursing research: Principles and methods. Lippincott Williams and Wilkins; 2004. 28. Myers ND, Ahn S, Jin Y. Sample size and power estimates for a confirmatory factor analytic model in exercise and sport: a Monte Carlo approach. Res Q Exerc Sport. 2011;82(3):412-23. doi: 10.1080/02701367.2011.10599773. [PubMed: 21957699]. 29. Reynolds CR, Richmond BO. What I think and feel: a revised measure of children's manifest anxiety. J Abnorm Child Psychol. 1978;6(2):271-80. doi: 10.1007/BF00919131. [PubMed: 670592]. 30. Wisniewski JJ, Mulick JA, Genshaft JL, Coury DL. Test-retest reliability of the revised children's manifest anxiety scale. Percept Mot Skills. 1987;65(1):67-70. doi: 10.2466/pms.1987.65.1.67. [PubMed: 3684472]. 31. Reynolds CR. Concurrent validity of "what i think and feel:" The revised children's manifest anxiety scale. J Consult Clin Psychol. 1980;48(6):774-5. doi: 10.1037/0022-006X.48.6.774. [PubMed: 7440835]. 32. Taghavi M, Alishahi M. [Study of validity and reliability of manifest anxiety scale for children]. J Psychol. 2003;4(7):42-357. Persian. 33. West SG, Taylor AB, Wu W, Hoyle RH. In: Hoyle RH, editor. Handbook of structural equation modeling. Guilford Publications; 2012. p. 209-31. 34. Hu L, Bentler PM. Cutoff criteria for fit indexes in covariance structure analysis: Conventional criteria versus new alternatives. Struct Equ Modeling: A Multidscip J. 1999;6(1):1-55. doi: 10.1080/10705519909540118. 35. Roemer L, Lee JK, Salters-Pedneault K, Erisman SM, Orsillo SM, Mennin DS. Mindfulness and emotion regulation difficulties in generalized anxiety disorder: preliminary evidence for independent and overlapping contributions. Behav Ther. 2009;40(2):142-54. doi: 10.1016/j.beth.2008.04.001. [PubMed: 19433145]. [PubMed Central: PMC3719394]. 36. Lee J, Semple RJ, Rosa D, Miller LF. Mindfulness-based cognitive therapy for children: results of a pilot study. J Cognitive Psychol. 2008;22(1):15-28. doi: 10.1891/0889.8391.22.1.15.